AEM Cold Air systems relocate the filter outside of the engine compartment for a cooler intake charge and more power over the rpm range! AEM Cold Air and Short Ram induction systems create MORE horsepower than EVERY intake system on the market. Only AEM induction systems feature CNC mandrel-bent 6061 aluminum intake pipes that are individually tuned in both length and diameter to maximize power in each application. 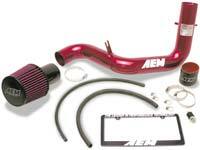 Every AEM intake is powder coated and has TIG-welded fittings and brackets. For filtration, AEM utilizes its new lightweight urethane, four-layer cotton-gauze filter that features a redesigned air horn that makes an additional 1-3 HP on our Air Induction Systems. All AEM air induction systems are C.A.R.B exempt and come with complete installation hardware, comprehensive instructions, AEM decal and license plate frame.